This probably started as a rant about the new Star Trek trailer, which I believe many of us are a little dubious about. But it has been pointed out to me by unnamed sources (i.e. a certain Little Red Haired Girl) that the trailer is 90 seconds, I’m reading a lot into it, and either way we’re going to see it and enjoy the movie on some level. I feel the same way about the new Peanuts movie, which I have not seen, but the trailer really worried me. I’ve heard it’s good, and I’ve heard it’s not, and if/when it comes to the dollar theater or Netflix I will watch it. Here’s what I am happy about. The fact that these movies exist means merchandising (where the real money from the movie is made) and licensed projects. 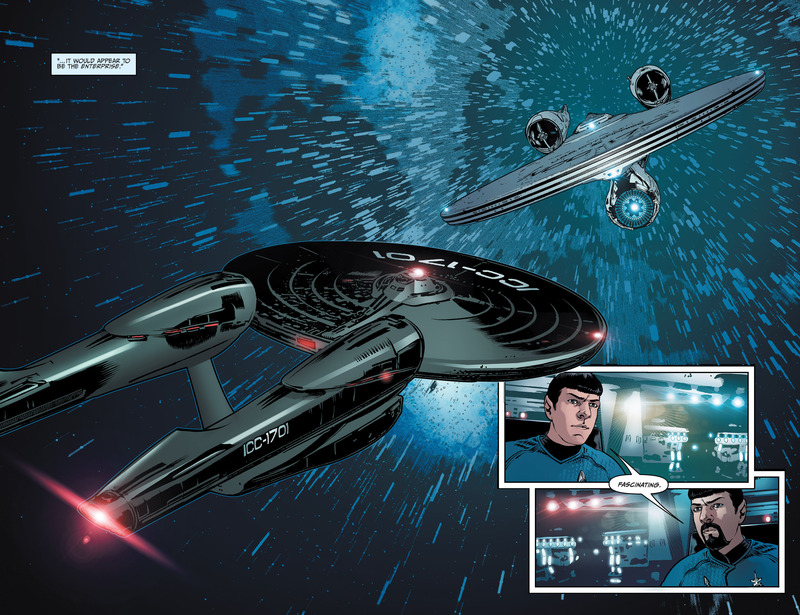 IDW picked up the license for Star Trek comics a few years before the new movie series and has been going strong for nearly 10 years. The ongoing series that weaves in and out of the movie timeline passed issue 50 a few months ago. I have 100’s of comics and stories that wouldn’t have existed were it not for the new movies and their popularity. This is my wallpaper at work. Don’t you love the artist’s reproduction of lens flares? The release of the Peanuts movie also triggered DVD releases of more of the old specials that have never made it to DVD, and the two feature length movies Bon Voyage Charlie Brown and Race For Your Life Charlie Brown. I may have some quibbles about the fact that they were fullscreen movies cut down to fit widescreen, but considering they were only previously available on VHS, I’ll take it. Even if the new movie is lousy, these two movies are great and are now out there for everyone to enjoy. Jurassic World was kind of a meh, but Lego Jurassic World with all four movies is a lot of fun (though sanitizing it so the dinos don’t actually eat anybody is weird). The Star Wars movie sounds like it will actually be pretty good, but even if it isn’t we have new comics from Marvel, releases of classic series, and really expensive Lego sets that I can covet from afar. There’s also a lot of crap that gets produced (I think my breaking point was the Star Wars Cover Girl ads). And honestly I don’t think the new Star Trek movies are suddenly going to get someone to go back and watch the show from the 60’s. But at least it’s an excuse to give the fans more to enjoy, and maybe even love. Yup – these characters feel like friends to me that I’ve known all my life and I can’t help but welcome them back as often as they pass by. Gladly. When the Tim Burton Dark Shadows movie came out, suddenly you cold get the two real Dark Shadows movies on DVD, after them being unavailable for many years (though it was till the chopped-up version of Night of Dark Shadows, rather than the restored original cut we were hoping for, but still). So, all to the good. Plus, Michelle Pfeiffer was terrific in the Burton movie, so even better. I watched the Star Trek trailer mostly because I’ve seen a least three articles with headlines like, “The Next Star Trek Movie Will Be Fast & Furious in Outer Space,” and I would totally watch that. I was not impressed by the original reboot, and I never bothered to see the second one, but this could be a step in the right direction.